Sister Mary Jane Hicks, S.H.C.J. Sister Mary Jane Hicks, S.H.C.J., a Sister of the Holy Child Jesus for 62 years, died Feb. 24 of pulmonary disease at Holy Child Center in Rosemont. She was 86. Born in Chicago, Sister Mary Jane met with sadness early in life when her mother passed away. Moving to her grandmother’s home introduced her to the Holy Child Sisters in grade school. After graduating from high school and working as a secretary for two years, she entered the Society of the Holy Child Jesus in 1951. She made her final vows in 1959 and became well known by her religious name Mother Mary Collette. Sister Mary Jane earned a Bachelor of Arts degree in history from Barat College in Lake Forest, Ill. and a master’s degree in secondary education from Notre Dame University in South Bend, Ind. in 1961 and 1967, respectively. 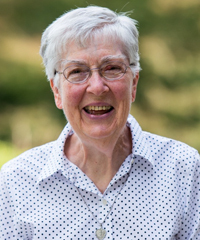 Sister Mary Jane’s teaching ministry spanned 22 years mostly in Illinois and also in New York and Washington, D.C. She served as business manager at the Holy Child provincial offices in Drexel Hill (1983-1986) then spent 10 years as a pastoral associate in New Mexico and in Chicago. A move to Rome, Italy, was next, where for five years Sister Mary Jane served her community in several ways while managing the household budget. She relished experiencing other cultures and visiting with Holy Child Sisters in Europe and Africa. Upon returning to Pennsylvania in 2001, Sister Mary Jane volunteered at Holy Child School at Rosemont and taught English as a Second Language at Providence Center in Philadelphia. Until recently, she continued volunteering at Holy Child School and joyfully participated in local activities, especially at Holy Child Center and Our Mother of Good Counsel Parish in Bryn Mawr. She celebrated her 60th jubilee in religious life in 2015. The funeral Mass was celebrated Feb. 28 at New Sharon Chapel in Rosemont. Sister Mary Jane was the loving daughter of the late Herbert Joseph and Isabel (Doyle) Hicks. She now joins her parents in eternal life. She is survived by two sisters, Sister Frances Hicks, O.S.F., and Carol Ruehl (Robert), and her brother Laurence J. (Judy), and several nieces and a nephew.